I’ve been having fun with my ice cream makers. I spotted a can of La Lechera in the Mexican food section of the grocery and it inspired me to create Dulce de Leche ice cream. It turned out to be a sweet, creamy inspiration. Here’s what you’ll need for one small freezer. I have a counter-top Cuisinart freezer. If you’re using the larger freezers that use salt and ice, you’ll need to double the recipe and you might be able to add a bit more half & half as well. Put the La Lechera in a bowl. Microwave for a few seconds to soften it. 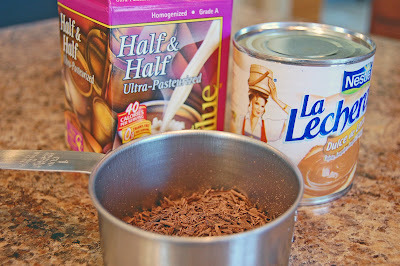 Pour this mixture into the ice cream freezer and follow the directions for your freezer. A few minutes before the ice cream is done, add the chocolate flakes. Serve right away or place in freezer to harden. Hey Tiffany! Do you like your ice cream maker? I have been contemplating buying one for months…haven’t done any real research! What is your opinion?? Did you find the La Lechera at Walmart??? I was just thinking I needed to dig my icecream maker out of the basement. Ice cream is ridiculously expensive and now in smaller packages. You must have been reading my mind with this post. La dolce… ICE CREAM! this just sounds so yummo (to steal another cool chick’s shtick).. you’d need to eat real healthy after that one.. stop by my blog to see how.. oooh teaser! Question…do you think you could make this low-fat (using reduced fat half and half)?? The King is trying to loose a few pounds, and he’s got a gigantic sweet tooth…well not gigantic. Just curious if you’ve ever played around with cutting calories in your recipes. Jill – I love the ice cream maker. I actually have 2, both gifts from my mom. They are convenient and easy to use. It's Always something – I did find the La Lechera at walmart in the mexican food section. Michelle – I've not tried it with the low fat half&half, but it's worth a try. I bet it would work. I don’t own a ice cream maker, and it’s good that I don’t. My face would be frozen in this dish! Looks. So. Delicious. Too bad I can’t have any b/c I’m in the throws of Operation Slim Down Quick. But, I’ll have to treat myself this summer:) Thanks for stopping by my place! I found the La Lechera Dulce de Leche around Christmastime and there are so many wonderful treats you can make with it and one of them is ice cream. 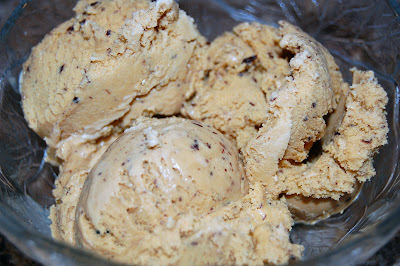 This has to be my all time favorite flavor of home made ice cream so far! So glad you found it! Your ice cream looks fantastic! Oh. My. Goodness. I need an ice cream maker! I’m putting it on my Christmas list now. Thanks for this recipe. I love Dulce de Leche but have never made it before. Sounds wonderful! 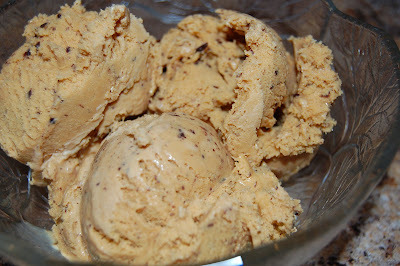 I LOVE dulce de leche ice cream! Yum! Guess I need to buy an ice cream maker…this looks GOOD! Ok so I didnt see this ice cream recipe. OMYGOODNESS I love dulce de leche. And in a ice cream oh my this is going on my list as well.